Ammanford care home Cartref Annwyl Fan, a CFW member and part of the Hallmark Care Homes group, saw its residents star in ITV News coverage for its beach inspired garden created by staff this month. 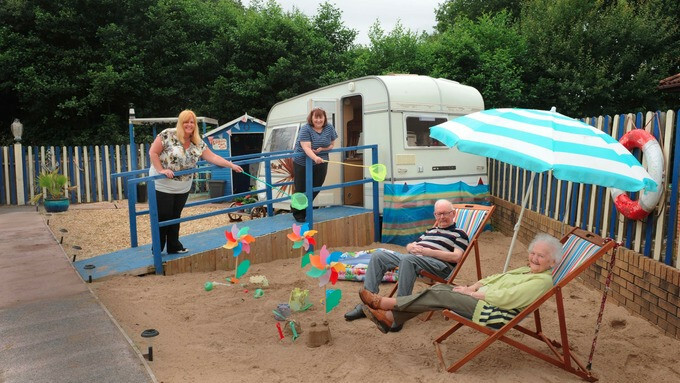 ITV Wales spoke to residents at the home – which specialises in residential, nursing and dementia care – about how they were benefiting from the garden complete with its caravan, beach hut, deck chairs and an imported shingle and sandy shore (pictured below). General Manager at Cartref Annwyl Fan, Adele Williams, said: “We decided to create a caravan and beach garden, after we asked our residents what they missed most and they said holidays by the seaside.